JQ Talks: [Giveaway] Shampoo Made From 16 Cups Of Coffee & You Can Grow Your Own Coffee Plant Once You're Done With It! [Giveaway] Shampoo Made From 16 Cups Of Coffee & You Can Grow Your Own Coffee Plant Once You're Done With It! Did you know (yes, I'm trying to look like I'm super knowledgable) that a medium cup of coffee (354ml) produces about 20 grams of coffee ground? It means the coffee grounds produced around the world in a single day reaches an enormous amount of 22, 000, 000kg. That's a lot of coffee waste! However, thanks to technology, there's a way to recycle these unwanted coffee into a fancy set of haircare range! A company called O'RIGHT found a way to make these unwanted ground coffee into 100% Recoffee oil, which then ben used as the main ingredient of the Recoffee haircare series. 16 cups of medium-sized coffee produces about 320g of coffee grounds, they are collected, roasted and sterilised before extraction. 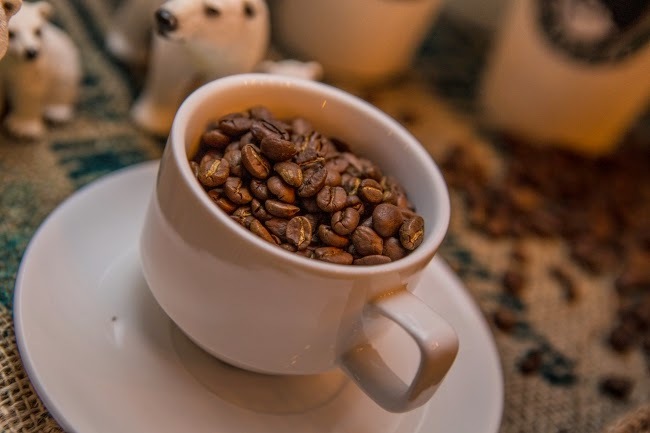 Only 5g of coffee oil can be extracted from 320g of coffee grounds. The precious coffee oil is further processed before added into the formula to make a 1,000ml Recoffee shampoo! That's not all. The remaining coffee grounds are also added into the production of the 100% biodegradable PLA shampoo bottles! These special ones are called Tree-in-the-Bottle and they have won Gold Award and Special Award at INPEX 2014 as well as 2014 Red Dot Design Awards in Packaging Design and CSR. This is where it gets interesting. After you have used up the shampoo, you can bury the bottle in soil. With proper environment, the seeds - encased at the bottom of the bottle - will sprout into coffee plant! Seriously, way too cool. According to studies, Recoffee Oil is a good source of antioxidants. It slows down ageing effectively, protects the skin and hair from heat damage and effectively replenishes the scalp and hair. It cleanses the hair gently and lock in moisture for shine and gloss. O'RIGHT shampoos do not contain environmental hormones, phtalates, parabens, formaldehyde, sulfates, DEA or artificial colourants. Instead, more organic ingredients such as ECOCERT organic foaming agents, ECOCERT and USDA certified organic plant extracts and ECOCERT approved natural preservatives are added. The unique bamboo caps are made through a rigorous ten-step process that hand selects and finishes with only the finest wood. Visit O'RIGHT Facebook page for more info. Win yourself a unique Tree-in-the-Bottle Moisturizing Shampoo (250ml) and Recoffee Deluxe Size Hair Oil (10ml) from this giveaway! Tell me (in the comment section) if you are excited to plant a coffee tree if you win the Tree-in-the-Bottle shampoo. Leave your Name, Email, Follower ID in the comment section below. Giveaway ends on the 17th April 2015, Friday, 11.59pm. Yes I am excited to plann coffee treee, in fact my dad's friend planted coffee tree before but that was long ago when I was studying in Kuching. Yeah pretty excited if I get to win the Tree-in-the-Bottle shampoo. What an amazing product line! I know the benefits of coffee are wide-spread, and I'd love to see what it does for my hair. But growing a coffee plant - How cool is that?? i am excited to plant a coffee tree because i am coffee lover and i think coffee shampoo is a interesting products and i love to try out. I want to plant a coffee tree at my office if I win the Tree-in-the-Bottle shampoo.It sounds cool and fun!! Being a coffee lover, I'd love to plant my very own a coffee tree, as I heard that the coffee flowers have a sweet distinctive smell and the prospect of harvesting my own coffee is just too exciting! Thank you all for joining this contest! would like to try it !